If you like using blueprints to visualize your dependency injection, a simple script can help you see if your beans or domains are getting too unruly. A blueprint is a dependency injection framework for OSGi bundles. It could be written by hand or generated using the Blueprint Maven Plugin. A blueprint file is just an XML file describing beans, services, and references. Each OSGi bundle could have one or more blueprint files. Blueprint files represent the architecture of our bundle. Let's visualize it using Groovy and graphviz, available in my GitHub repository and analyze. All you need is Groovy and graphviz installed on your OS. I am working mostly with bundles with generated blueprints, so I will use a blueprint file generated from Blueprint Maven Plugin as an example. All examples are included in the GitHub repository. The visualization is available here, or you can click on the thumbnail below to enlarge it. Now we have three slightly cleaner images: beanWithConfigurationProperties.png, beanWithCallbackMethods.png and otherStuff.png. It will generate an image with all beans from all files. Sometimes, it is difficult to spot and extract other domains. It will be easier to do some experiments on a blueprint. 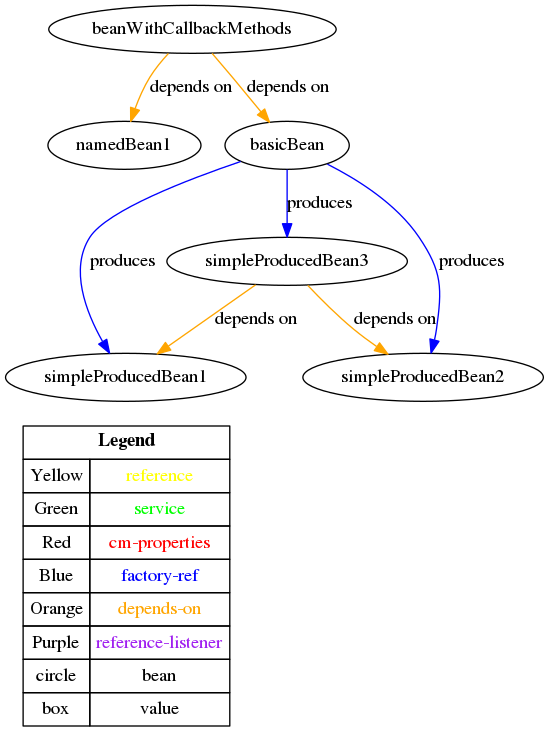 For example, bean my1 is a dependency for too many other beans. You could consider converting my1 to an OSGi service and extracting it to another bundle. The result is available here. Now we see that trees with root bean myFactoryBeanAsService could be separated and my1 could be injected to it as an OSGi service in another bundle. You could exclude more than one bean adding the -e switch for each of them, for example, -e my1 -e m2 -e myBean123. Blueprints are great for dependency injection for OSGi bundles, but it is easy to create a big context containing many domains. It is much easier to recognize or search for such domains using a blueprint visualizer script.